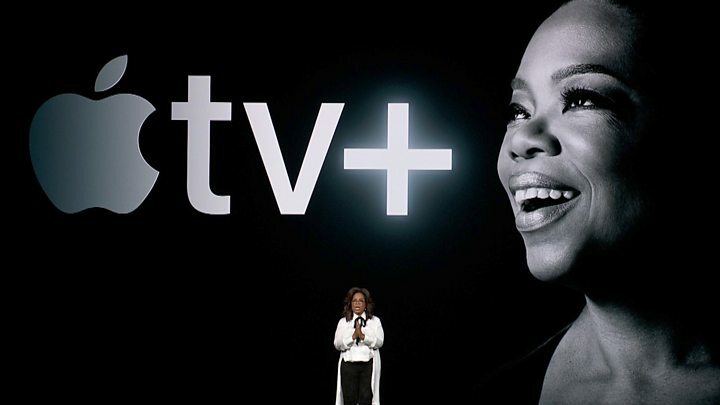 Apple has unveiled its new TV streaming platform, Apple TV+, at a star-studded event in California. Jennifer Aniston, Steven Spielberg and Oprah Winfrey were among those who took to the stage at Apple’s headquarters to reveal their involvement in TV projects commissioned by the tech giant. The platform will include shows from existing services like Hulu and HBO. Apple also announced that it would be launching a credit card, gaming portal and enhanced news app. The event was held in California and Apple Chief Executive Tim Cook was clear from the start that the announcements would be about new services, not new devices. It is a change of direction for the 42-year-old company. There had been much anticipation about Apple’s predicted foray into the TV streaming market, dominated by the likes of Amazon and Netflix. The Apple TV+ app was unveiled by Steven Spielberg and will launch in the autumn. Spielberg will himself be creating some material for the new platform, he said. Other stars who took to the stage included Reese Witherspoon, Steve Carell, Jason Momoa, Alfre Woodard, comedian Kumail Nanjiani and Big Bird from Sesame Street. The app will be made available on rival devices for the first time, coming to Samsung, LG, Sony and Vizio smart TVs as well as Amazon’s Firestick and Roku. The subscription fee was not announced, and notably absent from the launch line-up was Netflix, which had already ruled itself out of being part of the bundle. “The test for Apple will be, can new content separate them out from their competitors and can they commission and deliver on fresh new content that can reach audiences in the same way that Stranger Things has for Netflix for example?” commented Dr Ed Braman, an expert in film and production at the University of York. The Apple Card credit card will launch in the US this summer. There will be both an iPhone and physical version of the card, with a cashback incentive on every purchase. The credit card will have no late fees, annual fees or international fees, said Apple Pay VP Jennifer Bailey. It added that it will not track what users read or allow advertisers to do so. Apple News+ will cost $ 9.99 (£7.50) per month and is available immediately in the US and Canada. It will come to Europe later in the year. Unlike TV+, the news platform will only be available on Apple devices. An Apple TV app on Roku and Amazon Fire TV players is really kind of nuts. So why then keep Apple News+ a Mac and iOS-only proposition? Does Apple want to meet paying subscribers on the devices of their choice or not? A new games platform, Apple Arcade, will offer over 100 exclusive games from the app store which will all be playable offline, in contrast with Google’s recently announced streaming platform Stadia. It will be rolled out across 150 countries in the autumn but no subscription prices were given. in 2018 analyst firm IHS Markit valued the global gaming market on iOS, Apple’s operating system, at $ 33.5bn. There is space within that market for a platform like Apple Arcade which is not financed by in-app purchases or advertising, said IHS director of games research Piers Harding-Rolls. “Apple’s decision to move up the games value chain with a new, curated subscription service and to support the development of exclusive games for its Arcade platform is a significant escalation of the company’s commitment to the games market,” he said. Apple is making an aggressive push into several markets in which, thanks to sheer scale alone, it immediately becomes a massive player. Its TV service has been long in the making, and Apple has amassed a roster of big stars, as expected. A bigger test will be how creative those ideas will be – a lot of Netflix’s success has been about finding new talent, not throwing money at already famous names. I also have reservations about how many boundaries Apple will be prepared to push with its creative endeavours: if it’s as controlling with its television as it is with its brand, it will create a catalogue bereft of risk-taking. But TV is just a small part of what Apple is going for here. It wants (and needs) to turn its devices into the portal through which you do everything else – TV/film, gaming, reading the news… and you’d presume other things in the very near future. The announcement of a credit card shows how far Apple is prepared to go to make sure life is experienced through your iPhone. Tech Tent: Are tech giants held to account?